Car leasing is preferred over purchasing by many consumers in these economic times. In response to that popularity, major auto manufacturers and dealerships offer an incredible number of car leasing special offers and cheap lease car deals daily. With all of those great deals to choose from, how do you decide which is best for you? Service contracts are important, too, but most car lease offers will include sufficient service and regular maintenance. Keeping the vehicle in good repair is simply in the best interest of the leasing company. For most consumers in the market for car lease specials, the bottom line is price. Let’s examine the best ways to find the best deal on the car you’re planning to lease. This statement should come as no surprise. The Internet is today’s most efficient research tool. The average 13-year-old can do a Google search and find just about anything he or she wants. Just type in a phrase like “car leasing special offers” and you’re on your way, right? When it comes to searching for cheap lease car deals, though, that may not be the most efficient method. In fact, take a look at the results of a search exactly like the one mentioned above. Do you really want to wade through all of that to find the car lease specials that suit your needs? Defining your needs is the first step. Ask yourself a few questions before you start your journey into the maze of car lease offers out there. What kind of payments can you afford? What can you afford to pay at signing? How long do you intend to lease the vehicle? All of these and more questions can narrow your search if you use the answers to tailor it. For instance, let’s look at another Google search, this time for “car lease specials 2016 Acura under 200.” Here’s the first result on the list that was returned from the search. 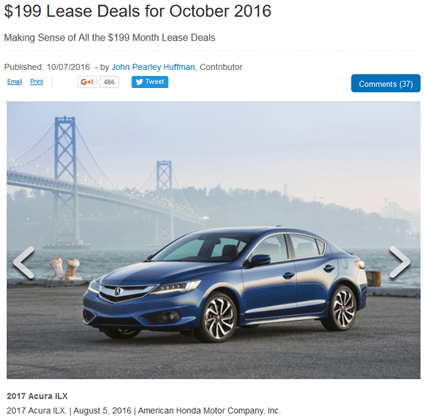 The car shown is an Acura ILX and the price is $199 – just under $200. You may have noticed that most of the car leasing special offers listed on the page were actually for 2017 models. Getting next year’s vehicle for the same rate isn’t a bad thing, right? The point is that being specific with your search for car lease offers will get you where you need to be in less time and save a lot of frustration. It’s also worth mentioning that specific searches will give you more specific results for cheap lease car deals on any of the major search engines. Yahoo, Bing and Google all use algorithms that work more efficiently with more specific criteria. That’s a fair question. For every consumer searching for car leasing special offers on a specific automobile, there are probably at least a dozen who simply want to find general lease car specials. Make and model may not be such an important consideration for those individuals. If you find yourself fitting into that category, the Internet is still your best choice as a starting point for a car lease offer search. In this case, you’ll still want to start with a major search engine, but a less-specific search is just a starting point. The end goal is to locate a site that lists information, like the best lease car offers, regularly. Yes, there were many more similar pages, but if you follow the links above, you’ll find that these lists are very nonspecific in regard to make, model, etc. If you’re simply “shopping around” for car lease specials, pages like these may be exactly what you’re looking for. Many car shoppers find these sites to be one of the best ways to locate car leasing special offers. In fact, according to Alexa, car.com receives tens of thousands of visitors per day. Does that mean that these websites are the optimum solution to locating auto lease specials? Perhaps, if that’s the method that works best for you. On the other hand, maybe you’re only interested in car lease specials from a particular auto manufacturer. Don’t worry; there’s a quick solution for you, too! If you’re a “Ford Gal,” “Chevy Guy” or have an affinity for any particular automobile make, simplify your search by going directly to the manufacturer’s website. Start your search for car lease offers there. Most car makers will have information on car leasing special offers available somewhere on their sites. By going directly to the source, you’ll increase the odds that the information you’re getting for car lease offers is the most current. Manufacturers increase their sales by updating their car lease specials on these sites often. It’s also a great way to save steps by specifying exactly what you want in the way of options. There are a couple of stumbling blocks when using this method. First, not every car manufacturer makes this information easy to find online. That’s often because they prefer to get your financial information first. For instance, note that some of the links in that list above take you to the company’s finance office page. This pre-qualification allows them to show you the best lease car offers for your personal situation. Second, you’ll notice that some of the sites linked above, as well as those you’ll find when searching on your own, will ask you to enter your zip code before showing you any information. Don’t panic; these sites are going to give you information about car lease specials from your local dealership(s). That’s a good thing. Unless you’re in a very small town, you probably don’t need to go far to find car lease specials. Of course, if you’re in the mood for a road trip, then by all means, use one of the methods above to find the car lease offers that appeal to you and head out! Otherwise, why not find out what your local car dealer or dealers are offering? Keep in mind that local dealerships don’t always have enough staff members to update their list of auto lease specials regularly. That being the case, you may miss out on the best car lease offers by using that last method. You may also find that most of the links returned will be to the car manufacturers’ main sites. The last option is something you should think about looking into. Then again, this method may not be the best way for you to find cheap lease car deals. Perhaps your job keeps you on the road and it’s easier for you to find car lease specials at your next destination. Whatever the case, actually visiting the dealership is an idea that should at least be considered. Finding car lease specials shouldn’t be a difficult undertaking. Major automobile manufacturers and even your local dealerships will almost always have cheap lease car deals available. Knowing how to find those deals is key, and this article has offered an overview of several methods in this article. Locating the best car lease offers for your needs means narrowing the sea of car lease specials down to a navigable level. That’s a simple matter of choosing one or more of the methods above and utilizing them effectively. If you opt to use the search engines, the type of search phrase you use will determine the type of car leasing special offers you’ll find. 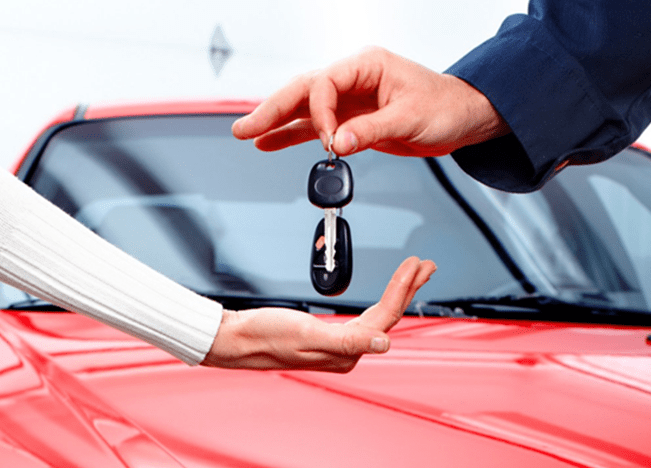 No matter what methods you choose, you should now have the information you need to locate the right car lease specials to ensure that you find the best deal for your next car. You already know the advantages a car lease offers you. Now you know how to find the one right for you.